No two night patrols on the Osa are the same, but they usually have the same rhythm. Every now and then, however, something unexpected happens that makes the whole night worthwhile. On November 3, I had one of these experiences. But to fully understand it, I have to tell you about the patrol I had on October 21. That night I was patrolling Pejeperro Beach with Emily, another Research Field Assistant. It was one of those long nights where we knew we would not be back to the station and in our beds until dawn. While the Osa Peninsula, rich with biodiversity and sheer beauty, is a wonderful place to kick back and relax, there are numerous opportunities for visitors to catch a glimpse of some of the world’s most fascinating reptiles. Some of which, like the Terciopelo, can be especially hard (and dangerous) to spot. The Terciopelo is a beautiful dark grey, brown or olive green snake, with a dorsal pattern of triangular designs on both sides of its body, resembling a letter ‘X’ visible from above. It’s a large snake that can grow up to 250 cm (over eight feet!) in length, although the average adult is between 140 and 180 cm (4.6 to 5.9 ft) long. The females are much longer than the males. It principally eats small mammals and birds. The species is viviparous, which means that the embryos grow inside of the mother and are born fully formed. Furthermore, the snake is very fruitful; it can give birth to up to 90 offspring. 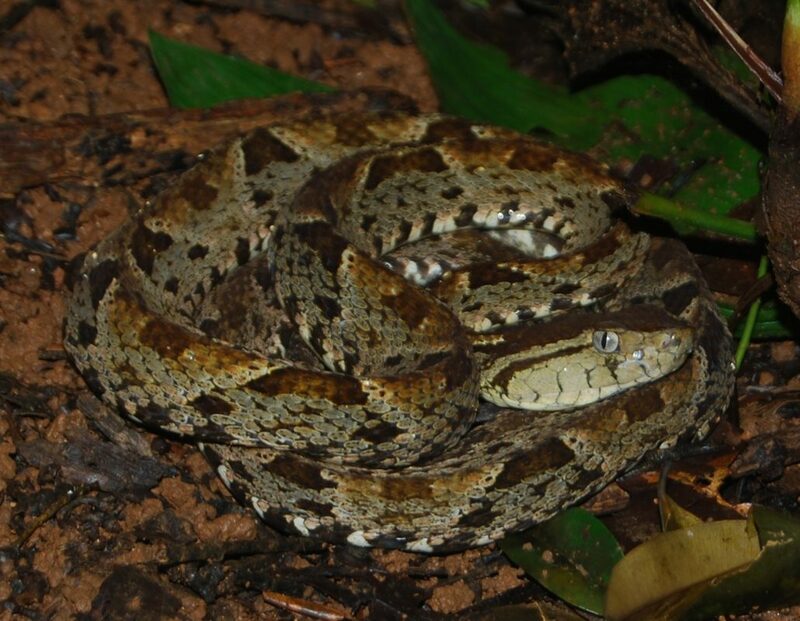 This high fertility explains in part why the Terciopelo is one of the most abundant snakes in Costa Rica. 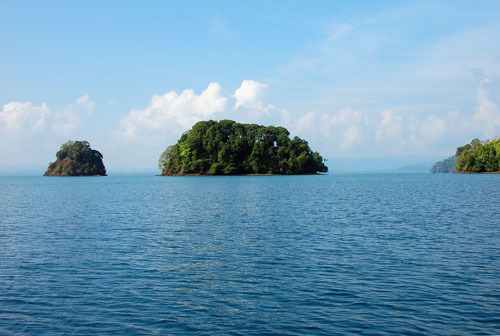 Mogos Islands mark the highest waters of Golfo Dulce. While Jorge and I both loved working on the water, the results of our research brought the greatest rewards. Golfo Dulce is a true bio-gem—one of Costa Rica’s preeminent riches. 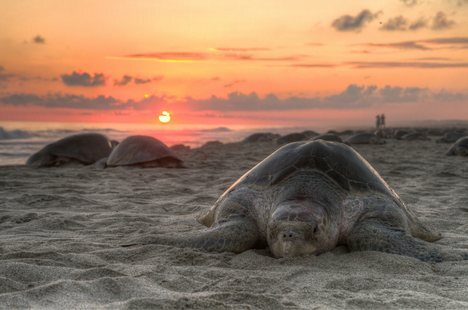 Several hundred Green sea turtles, critically endangered Hawksbill sea turtles, Olive Ridley sea turtles and (reportedly) Pacific Leatherback sea turtles, rest, feed, mate and nest in the gulf. A rare xanthic colony of pelagic sea snakes resides around the inner basin. Both Northern and Southern Hemisphere Humpback whales enter the inlet to give birth and possibly provide sanctuary for young calves. Whale sharks aggregate in Golfo Dulce. Resident dolphins and other toothed cetaceans breed and raise offspring. Scalloped hammerhead sharks are born there and needlefish spawn. What a remarkably vibrant bionetwork! 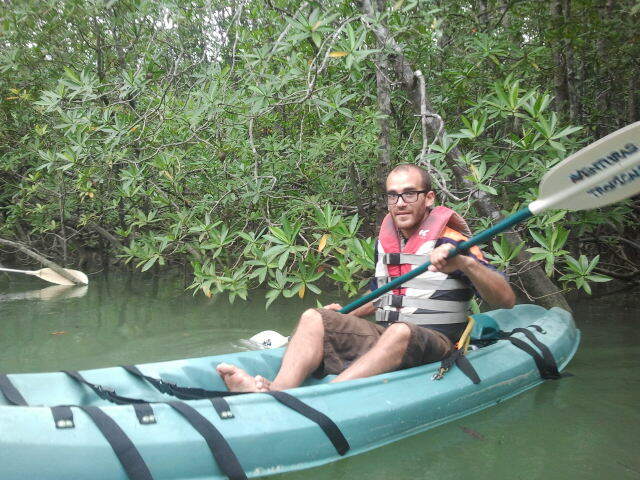 Luis Daniel Montero is a 22-year-old kayak tour guide and volunteer for ASCONA (Asociacion De Servicio Comunitario Nacional y Ambiental), a local non-governmental organization dedicated to community service and environmental conservation on the Osa Peninsula. Along with a few other ASCONA volunteers, Daniel, as he prefers to be called, is part of an extremely passionate group of activists protesting an American business-owner’s proposal for a large marina development project on the Gulfo Dulce, a proposal met with considerable opposition among Osa residents and various conservationists on and around the peninsula. 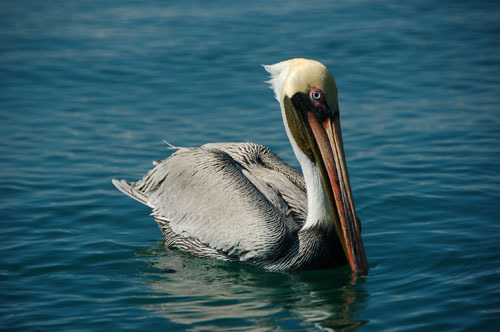 The name “Brown pelican” belies the attractive hues of a mature bird. I’m sure it comes as no surprise that during our 400+ hours of observation in Golfo Dulce, Jorge and I witnessed an astonishing array of marine life. Indeed, we were astounded by the intense biodiversity revealed to us during our research. In addition to the animals I’ve already blogged about in this series, many more are worth mentioning. 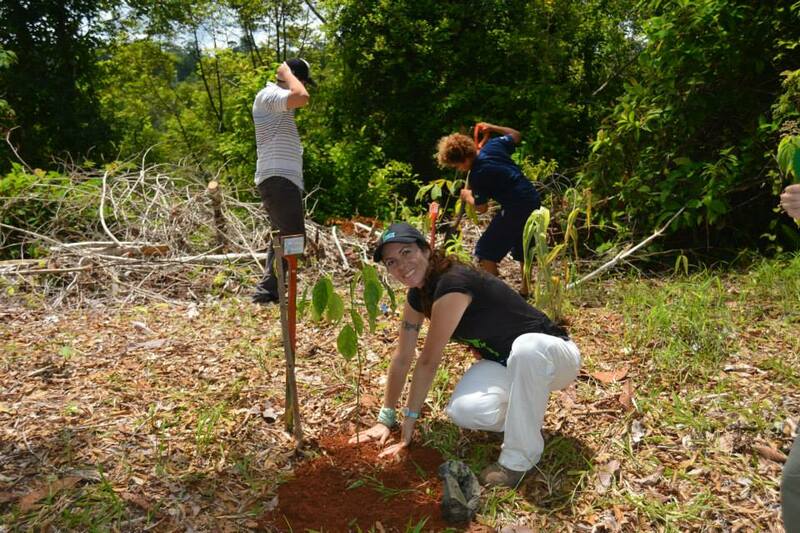 Some were officially documented, others were not, but all helped define our emerging portrait of Golfo Dulce. Brown pelicans (Pelecanus occidentalis) are commonly seen in Golfo Dulce and we located a year-round communal roosting area along the banks of Piedras Blancas National Park in the upper half of Golfo Dulce. We saw many other marine birds, too, including Brown boobies, magnificent frigates, osprey, several species of gulls, terns, swallows, herons, ibis and dozens more wading and estuary birds. An anticipatory rumble of thunder sounds far away, off shore. It has an almost calming sound as we make our way through the dark squishy forest path, the sky patterned with silhouettes of tree leaves. 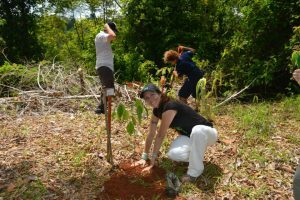 The jungle is alive with night sounds, from the echoing song of the nightjar to the almost space-invader beep of frogs on Las Rocas trail. 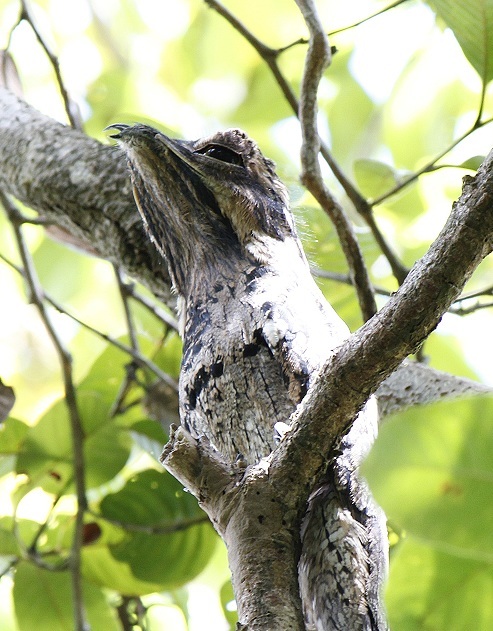 A silky white two-toed sloth is spotted, high up in a tree, taking the night off. I envy its slow slumber for just a moment before I remember that this trail is taking me down to the beach, down to witness a spectacular and sacred event, one that only a few people in the world have the chance to be a part of. Tonight, I am walking a stretch of beach along which nesting mother sea turtles will, with great care and diligence, lay their precious eggs in the sand.